You must have spotted the parade of elephants around us off late. We absolutely adore the sweet, innocent,chubby elephant motif adopted by a lot of our pattern makers in their recent designs. 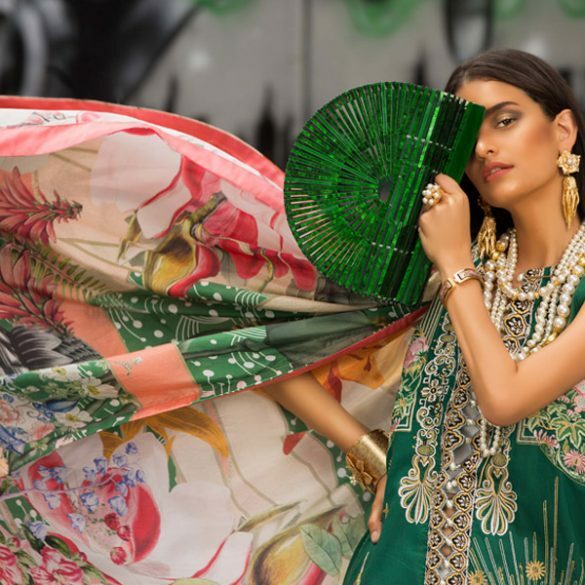 While some like Amna Iqbal and Rida Shazad have playfully incorporated it using colorful embroidery, others like Rabia Wahab of Fiction Concepts and Blocks have opted for artistic block print techniques. We love Fiction’s black and gold signature block printed palazzos with the blue elephant border that can be worn with any kurta to add a distinctive element. Sana T is another one of our favourite Pret designers who is fond of using animal art in her block /screen print ensembles. We love this traditionally equipped pink elephant back motif that has been carefully screen printed onto satin and then appliqued onto the shirt fabric. Not only has this pattern been widely popular in the contemporary Pret circles, but it has also been intricately used by Nida Azwer in her glorious Awadh Court Collection for the regal and noble stature of the elephant in our culture and history. We salute Nida for the delicate detailing in this piece that effectively conveys an entire story in itself. The elephant was also brilliantly used by Shehla Chatoor in her Spring Equinox Collection of Western jumpsuits and dresses at FPW 2012. Shehla is a master of screen print techniques on luxuriant charmeuse fabrics and we loved her mini elephant vertical stripes. The elephants have also taken over our accessories! Our favourite local shoe stylist, Zahra Habib who loves to work with nature has created these exclusive red suede flats with a diamante encrusted elephant brooch and a super comfortable gold leather base. Do you have any elephant themed pieces in your closet yet? If not get your hands on one now and be part of this trend! Visit the profiles of the above mentioned designers to view their entire collections.